Tonight we are going to review a wine blend made of feteasca neagra, cabernet sauvignon and merlot grape varieties, where the first one is the key, as it is an indigenous variety that adds local terroir to the final blend and that extra something that is so desired and sought after by the consumer. 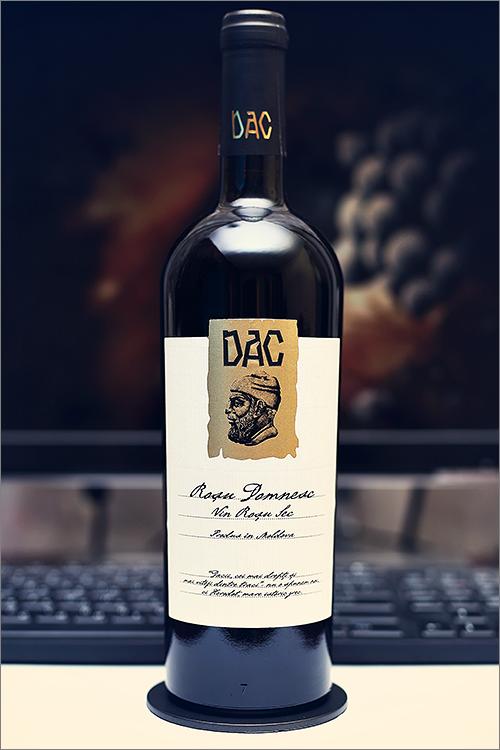 The wine we’ve selected for the review tonight is Rosu Domnesc 2014 from Vinaria Dac. We have already mentioned the enormous potential of indigenous local varieties, especially when blended with international ones, and this time we are talking about absolute harmony in a blend. But enough theory, let’s move on to the tasting and find out how good this wine is. Noble garnet color, with shades of deep purple towards the rim of the glass. The nose is strong, filled mostly with black fruits flavours: sour cherry, black currant, ripe cherry, black plum, red currant, rose hips, nutmeg, black cherry and some nuanced hints of black soil. An instant later the nose is filled with notes of red and black pepper, medium roasted oakwood, cherry tree wood, leather and hints of black tea blend. The wine is extra-dry, with high alcohol level, high acidity and ripe tannin. It feels bold, complex and elegant, with a nuanced fruit-forward profile. This is definitely new world type of wine – tart, seedy and lean. The wine has a fair overall balance between fruit and barrique and a quite nuanced acidity. It has a medium-plus finish and a balanced, a bit tart aftertaste. This is definitely a great Wine of Moldova and the overall rating says the same, with 90.7 points scored it is right there, among the best wines we’ve tasted so far. Please click on the chart icon on the left in order to get to the wine rating page, where you can find all the wines we’ve tasted to date. Conclusion: this is a wine that is not yet on its peak form, as it requires at least a couple more years of bottle ageing (2 to 3 more years will suffice) due to its overwhelming acidity. It has a fine grained tannin and a very nicely integrated alcohol level. The wine feels a bit oaky, a bit earthy, but mostly fruity and quite elegant. We would recommend to pair this wine with rare or medium-rare veals steak or some cold cuts, like for example a cured meat board. Enjoy.